Subscribe to my page on Facebook and never miss my new illustrations and designs! I’m a digital artist from Moscow, Russia. My first art pieces have been created under the influence of surrealism and modernist style; later on I got very interested in fantasy. I think, my style have been developed out of these three schools. What’s more, it’s being constantly enriched by new elements of various areas where I draw inspiration from. My style absorbs the influence of modern trends, industrial esthetics, anime, subcultures. The themes I prefer are surrealistic metamorphoses, contrasts (inside/outside, victim/predator, etc.) as well as unity of opposites. Thinking over the concepts for my new works, I look at them as visual metaphors – if we take my illustrations for books, for example, they show not particular scenes, but ideas. I’m still in the process of developing my style, and I always strive to add new facets to it. Since childhood I have participated in art exhibitions and contests, studied painting at Moscow State University of Service (the Faculty of Design and Applied Arts, Specialty Miniature Painting). When a student, I took interest in digital art, as I realized that only computer graphics would allow me implement my ideas. Today I work with 2D and 3D technologies and animation and always strive to improve my skills. Yet the three-layer oil painting technique I’ve mastered still helps me to create digital pictures. I’m a member of the Creative Designers Union and the international art collective SlashTHREE. 2012 (january, 19) - diploma of the exhibition and contest “Rainbow in Winter” (Moscow). - The art book of Moscow Comic Convention 2016, illustration "Revelation". Artist alley of “Moscow Comic Convention 2016” event in Sokolniki congress-exhibition center, (Moscow). “Confession in Color” - exhibition in the Museum of Decorative, Applied and Folk Art,(Moscow). 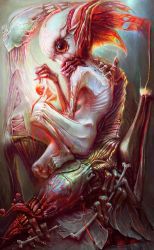 “War” - on-line exhibition by the international art collective SlashTHREE, illustration “Inner War”. “Reclaim” - оnline and live exhibition by the non-profit organization DACS (Designers Against Child Slavery) (New York City). “Rainbow in Winter” - exhibition by the Union of Designers held in the Museum of Man (Moscow). Exhibition for young painters of Moscow Artists Union, hall «Na Begovoy” (Moscow). Exhibition in “Gallery Tonne a/s” (Norway). Exhibition in "Summer Gallery" (Spain). Exhibition for young painters of Moscow Artists Union, Kuznetsky Most exhibition hall (Moscow). Solo exhibition, Tushino exhibition hall (Moscow). "The Fantasy World of Kseniya Lvova” – solo exhibition organized by Russian Artists Union, Rosizo gallery (Moscow). Wishing you a very from cemac and and may this year be your happiest and most successful and creative one yet.